Rösrath/London – It was Karl Hansmann's 2nd visit at IMO to present his worldwide unique rescue systems there. In 2011 he already showed the diver locating system ENOS on the international stage where it attached high attention. The device enable a prompt rescue without support of coast guards and technical expenditures – worldwide, in daily applications, successful and reliable since 2005. The attendees of IMO conference were seriously impressed of ENOS-System although they were mainly focussed on merchant marine and not on sports diving. They all asked Hansmann for a smaller beacon because the ENOS-Beacon was too big and too heavy to embedd in seafarer's PFD. Times have changed meanwhile! 2015 Seareq launched a MOB-System working on the same principle of functioning like ENOS: the Man-Over-Board-Operating-System MOBOS. The Beacon has the measurements of 200 x 35 mm only (Length x Diameter) and weighs 165 grams including batteries. Though it is one of the most compact and lightest beacon of the market which is the reason why it even fit in children's and SOLAS lifejackets. 2016, it was that time again: Both Seareq Rescue Systems were presented in London at IMO where again they attached high attention by the delegates. "The new shape of the Beacon impressed the as well as the well-proven principle of functioning of our systems ENOS and MOBOS. 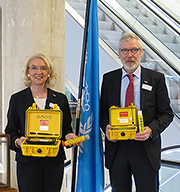 Both working independent of international emergency frequencies and don't add further false alarms on the overloaded rescue chains", Hansmann sums up and smiles: "The facts that Seareq-Systems are able to receive, to evaluate and to display multiple GPS supported alerts simultaneously – that rescue operations supported by Seareq-Systems are successful and reliable since more than 11 years and that our devices cover a receiving range up to 5.6 Nautical Miles – has enthralled the international delegates."